Please vote for us now because Disabled People want to be part of the digital future! WECIL was established as a charity in 1995 and is managed by Disabled People for Disabled People. We provide a range of support and advice services across Bristol and the surrounding areas to enable Disabled People to live as independently as possible and aim to help them overcome the barriers they face to being fully included in our society. We support people with any kind of disability, and have services for all age groups. We're user-led, so Disabled People have a say in everything we do. This means that we can be sure our services meet the needs of Disabled People and delivered in way that works for them. As well as providing support on a one-to-one basis, we run social, group activities to overcome the isolation many Disabled People face and help them to increase their confidence levels through sharing their experiences with other Disabled People. The results are that disabled people are better informed and are able to access the services and support they need to enjoy improved health and wellbeing. But…we want to reach more Disabled People; support more Disabled People, especially younger Disabled People. One of the ways we want to achieve this is by increasing our online presence so that we are more visible and easier to find for Disabled People who are engaging with social media platforms. The online world overcomes many of the barriers that Disabled People face to being included in society: online services can be more accessible and socialising is made easier through social networking sites, which helps Disabled People to link up and support one another. We also want to raise awareness amongst non-disabled people about the barriers that our clients face, so that they too can help us create a fairer society that doesn’t put up barriers that prevent Disabled People from leading independent and fulfilled lives. Most of the support WECIL provides is funded by local authorities. However during the economic downturn we have seen our funding reduced and we need to be smarter about money. Disabled People are also feeling the pinch as a result of changes to benefits and local authority cuts to vital services; more than ever they need our support. We find ourselves having to do more with less. We are keen to engage with potential corporate sponsors and form effective partnerships with local organisations and businesses who may be interested in supporting our work. To help us do this we need support to improve our digital marketing. 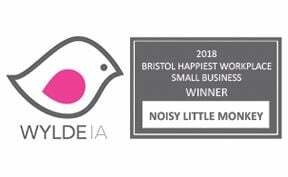 In short, the support available from Noisy little Monkey would enable WECIL not only to reach more disabled people and their families who need our support and advice, but it could also help us to secure additional funding to increase the impact of our work. We're counting the number of Tweets, Likes, Pins and +1s this page gets, using the sharing buttons at the top and bottom of the page. The volume of these shares will help the judges choose who should receive our help, so get sharing! Then, really help the cause by using the Facebook comments below to tell us why YOU think WECIL should win £9,000 of digital marketing. GO!